As a family caregiver for a senior adult with Alzheimer’s disease, routine is one of the most important tools that you will use to help you ensure that your parent gets the care that they need on a regular basis. The schedule that you choose for your parent should include not just the care tasks that they need to manage their personal care and activities of daily living, but also activities that stimulate their mind and that they enjoy. These will help to maintain a sense of normalcy and personal identity, support their mental and emotional health, and encourage quality of life. * Keep in mind your parent’s abilities as you plan activities. You want for them to be able to participate as much as possible and not to get frustrated or upset, which can happen when you encourage activities that are beyond the symptoms that they are currently exhibiting. * Remember that just because your parent is living with Alzheimer’s disease it does not mean that they are no longer aware of anything around them or that they are incapable of experiencing any type of pleasure. Encourage them to participate in the activities that they have always enjoyed, but adjust them to fit with your parent’s abilities now. * When introducing an activity, play close attention to how your parent responds to it. If they start to show that they are anxious or nervous, stop the activity and consider not planning it again. * Watch what they do naturally and incorporate those activities into their routine. For example, if you notice that your parent tries to clean up at a specific time of day without you instructing them to, choose this time in their routine for housekeeping tasks. * Don’t focus too much on what your parent is achieving in what they are doing, but the benefits that they are getting out of it. 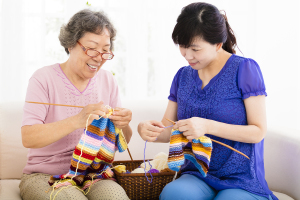 They might not be making a beautiful scarf, but if they are enjoying the process of crocheting it, that is all that matters. If you have been looking for ways to enhance your parent’s life, improve their care, and support their highest quality of life possible as they age in place, now may be the ideal time for you to consider starting senior care for them. A senior home care services provider can be there with your parent to ensure that they always have access to the level of care, support, and assistance that is right for them to help them manage their individual needs and challenges, seek as much activity and independence as possible, and life a fulfilling lifestyle as they age in place. These highly personalized services can include safe and reliable transportation, assistance with keeping their home clean and healthy, assistance with personal care tasks such as bathing, grooming, and toileting, medication reminders to keep them compliant, and help with needs such as meal preparation. As a family caregiver, knowing that your parent is getting these services can give you peace of mind and ease your stress, allowing you to take a step back and focus more time and energy on other needs in your life, such as your children, your marriage, your career, and yourself. For Senior Care Services in Bartlett TN, please contact the caring staff at Personal Care Services MidSouth today! This entry was posted in Alzheimer's Disease/Dementia, Senior Care Bartlett TN and tagged Senior Care Bartlett TN. Bookmark the permalink.